Can an Issuer Refuse to Remove a Legend from Restricted Stock? Any stock you buy in a private placement is likely to be what is called restricted stock. Most certificates representing restricted stock have a notice, or legend, stamped on them indicating the stock is restricted. 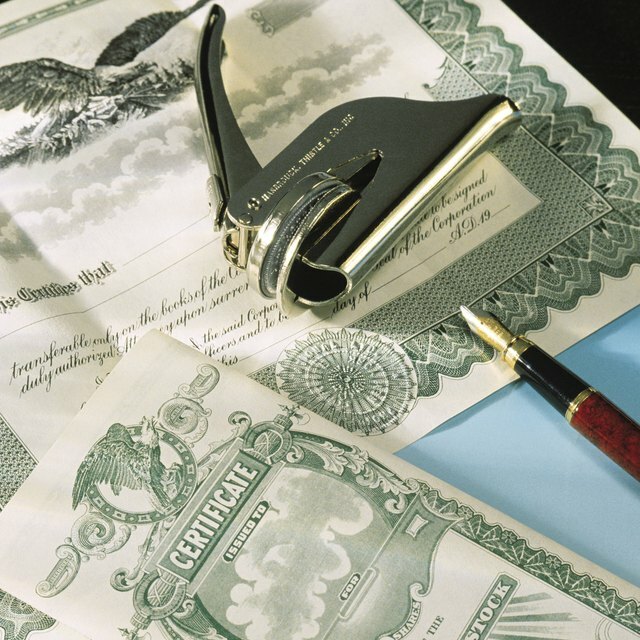 Not all certificates have this stamp, so it is a good idea to check with the issuer before you attempt to sell the stock. If you have such stock, there is a process to go through before you can sell the shares. Read the legend. It will usually state the length of time the shares must be held before the restriction is lifted. The restriction runs from the date of issue, which should be listed on the certificate, through six months or one year. Some restrictions run longer. Contact the investor relations department or the office of the chief financial officer of the issuing company to ask about their restricted stock procedures. Some companies will refer you to their transfer agents. Other companies will refer you to their corporate attorneys, and some will just take your name and send you new certificates, or an opinion letter stating that the securities are off restriction. Fill out any paperwork and send it and your original certificates via certified mail to the issuer's transfer agent. Retain a copy of all documents for your records. The usual forms consist of instructions for the registration of the shares, and a form representing that the shares are off restriction, if the legend makes clear the restriction period. You will probably have to supply an attorney's opinion stating the stock is off restriction, which you can obtain from the issuing company. What Is a Letter of Transmittal Related to Stocks? What Is the Procedure to Transfer Stock From a Deceased Owner to a Beneficiary? Check the information on the forms before sending. Your securities will be registered in the exact manner you stipulate, so don't use any nicknames or abbreviations. If you do, your broker might not accept them if the registration does not match the name on the account. Include the transfer agent's fee, or your securities will likely just sit on someone's desk at the transfer agent until you call and ask why you haven't received your new certificates. The fee is generally between $25 and $100 and, if paying by check, send a bank or certified check. The transfer agent may accept credit or debit cards, so ask for payment options if you don't want to send a certified check. If you bought stock trading publicly on an exchange, your stock is not restricted. Only stock issued privately by the issuing company or an affiliate of the issuing company carry a restriction. An affiliate would be a shareholder, executive or board member of the company. If you are in doubt, call the company or transfer agent, and give a list of your certificate numbers. Do not disregard the restriction on your shares. If you do not have a certificate with the imprinted legend, but you think you bought the shares privately, check before attempting to sell. If the company has recently begun trading in the public market, and your broker sells the stock on a to-be-delivered basis, your certificates can be refused and you will have to cover your sale by purchasing trading shares in the market. This could result in a significant loss if the market moves against you.